A UNESCO World Heritage site, the medina, or old quarter, of Tunis was built during the seventh century AD. From the 12th to the 16th centuries, Tunis was considered to be one of the greatest and wealthiest cities of the Islamic world and its medina is testimony to its former grandeur. 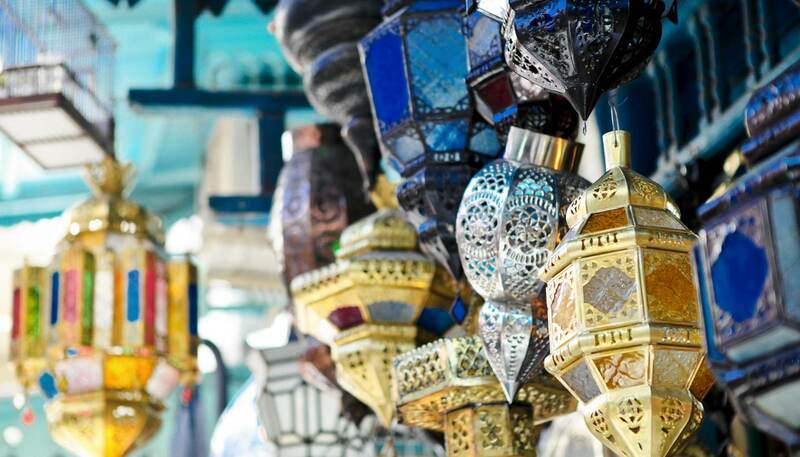 Today, visitors can step back in time through the maze of narrow, winding streets, and barter for souvenirs with the locals; goods on sale include colourful hand-made carpets, hand-crafted jewellery, copper and brassware, pottery and exotic spices. The endlessly twisting streets can be disorientating, but it's as much fun to give yourself over to random exploration and the happy accidents of discovering traditional craftsmen, food markets and ancient monuments. Among the more frequented attractions found within the walls of the medina are the ninth-century Al-Zaytuna Mosque (Mosque of the Olive Tree), the perfume makers' Souk el Attarine and Tunis's first Ottoman-style mosque, Sidi Yousef, built in the 17th century. Tunis's main thoroughfare is the elegant and wide tree-lined avenue Habib Bourguiba, which runs from the TGM train station to the main entrance to the medina. Lined with banks, shops, restaurants and café terraces where Tunisians converge in the late afternoon, it also boasts the grand art nouveau Municipal Theatre and the 19th-century Cathédrale de St Vincent de Paul. A statue of the great medieval Arab (and Tunisian) scholar Ibn Khaldun stands opposite the cathedral, while modern Tunisia is represented by the huge clock tower built to commemorate the presidency of Ben Ali. Built in the 13th century, and recently extensively renovated and reorganised, this splendid palace is now not only an outstanding example of Arab-Muslim architecture, but it also houses Tunisia's national museum. The main reason to come here is to see the astounding array of Roman mosaics, the largest and finest single collection in the world, dating from the second century BCE to the seventh century AD. The Greek and Islamic holdings are also excellent. Arrive either early or later in the day to miss the massed tour groups. Tue-Sun 0900-1700 (Jun-Sep); Tue-Sun 0930-1630 (Sep-May). Laid out by the French, this once exclusive park with a lake, a small zoo, an elegant 18th-century pavilion and a café terrace is now a popular place for Tunisians to escape the summer heat and noise of the city.